Jennifer Egan to Publish New Novel MANHATTAN BEACH with Scribner in October 2017 | News and Corporate Information about Simon & Schuster, Inc.
NEW YORK, March 3—Pulitzer Prize-winning and New York Times-bestselling author Jennifer Egan will publish her next novel Manhattan Beach with Scribner. 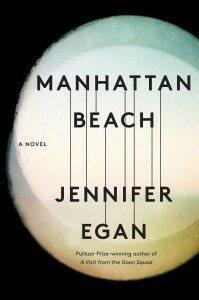 To be published on October 3, 2017, Manhattan Beach takes place during the World War II era and tells the haunting and propulsive intertwined stories of heroine Anna Kerrigan, the Brooklyn Navy Yard’s only female diver, her father Eddie Kerrigan, who works for both the union and the mob, and nightclub owner Dexter Styles, Eddie’s complex and charismatic boss. A simultaneous audio edition will be published by Simon & Schuster Audio. “Exhilarating though it was to immerse myself in an underworld of gangsters and sailors, the real imaginative leap in Manhattan Beach was into a time when the rules governing female behavior were still so rigid. The underground nature of female strength and sexuality allowed for a heroine-driven adventure story that would be hard to cast in contemporary America. I’m thrilled to be publishing this novel with Scribner,” said Jennifer Egan. “Jennifer Egan is one of the greatest living American writers, and we are overjoyed to publish her magnificent new novel at Scribner. Manhattan Beach is an extraordinary portrait of this country before and during World War II, a time of sweeping transformation and opportunity. Deeply researched and with daring characters, it is Egan’s most majestic work,” said Nan Graham, Jennifer Egan’s editor and Senior Vice President, Publisher of Scribner. Jennifer Egan is the author of five books of fiction, including A Visit from the Goon Squad, which won the Pulitzer Prize and National Books Critics Circle Award; The Keep, a national bestseller; the story collection Emerald City; Look at Me, a National Book Award Finalist; and The Invisible Circus, which was adapted into a major motion picture starring Cameron Diaz. Her work has appeared in numerous publications such as The New Yorker, Harper’s, Granta, McSweeney’s, and The New York Times Magazine. Nan Graham acquired North American and audio rights for the novel from Amanda Urban of ICM Partners.